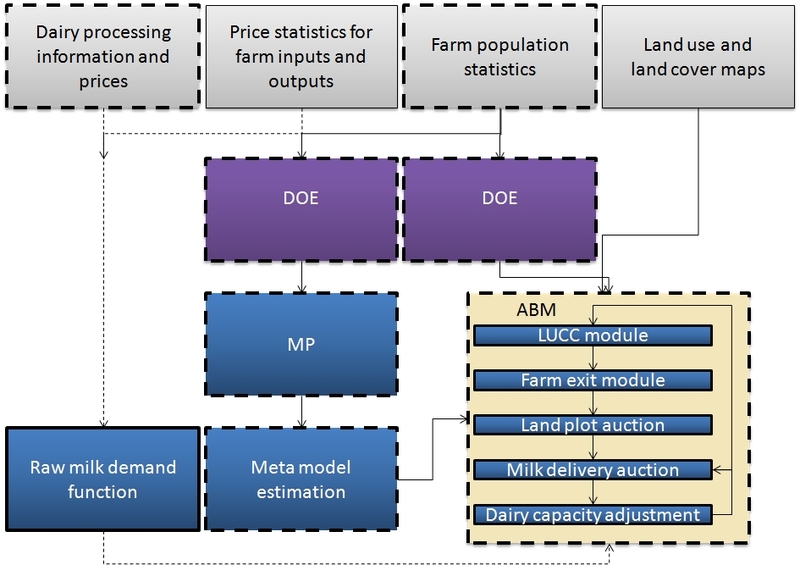 The central hypotheses to be investigated in this research project is that farm structural change in the German dairy sector is the outcome of the interaction between processes at the farm and processing level and that an improved understanding of these processes can be reached by the application of Agent Based Modelling (ABM), which allows to explicitly depict spatial interactions. structural change analysis at the dairy processing level. A special focus will be on the use of ABM and explicit modeling of interaction between farms or dairies and farms as this stands at the center of our proposal. Information on the ABM to be used and further developed in the project can be found on the ABMSIM web page. Given the integration of the farm and processing level in one ABM, this offers unique and innovative insights into determinants and interactions effects of structural change. The dairy sector is well suited for this analysis as there is this nearly perfect linkage between production and processing as only very little milk is sold directly at farm level. The expected outcomes are of relevance for the dairy farm sector and the dairy production chain as dairy production is an economically important part of the agricultural and food business. For the farm sectors, the regional structural change in the dairy sector has important implicit repercussions for regional land markets and landscapes. The medium- to long-term international competitiveness of the German dairy companies depends on the functioning and cost-efficient input sourcing.